Just because Ivy League schools don’t get as much attention in the world of sports as they do outside of it for their highly reputable teaching and researching systems, that doesn’t mean that some of today’s professional athletes didn’t get a top of the line education before turning pro. For BC Lions receiver Marco Iannuzzi, attending Harvard University was just the first of many goals that he hoped to achieve and the rest of them have slowly started to fall into place ever since he was selected with the sixth overall pick by the BC Lions in the 2011 CFL Draft. Iannuzzi’s rookie season was definitely a bit more memorable than what most players can say about their own, as the BC Lions locked up the 99th Grey Cup with a 34-23 victory over the Winnipeg Blue Bombers at home in Vancouver. 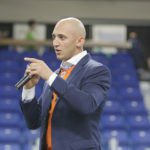 In just his first season in the CFL, Iannuzzi is blessed to have already won a Grey Cup as some players go their entire career without ever winning the Grey Cup or making an appearance in the championship. Understanding the situation he is in and the opportunity he has been blessed with, Iannuzzi will return to his hometown of Calgary, Alberta, on March 22, 2012, along with the Grey Cup for his Climb for the Cup event he his hosting through the Branch Out Neurological Foundation; a Foundation that raises funds for research of natural and holistic therapies for neurological disorders in hopes of finding a cure for the various complications of the nervous system. “I knew that I was bringing the Cup back and I knew I wanted to support a good cause so I immediately thought about doing something with Multiple Sclerosis because my mother has suffered from MS for as long as I remember,” explained Iannuzzi. “I wanted to be a doctor when I was younger because I thought I’d be able to cure MS, but I quickly realized that my passion wasn’t in becoming a doctor but finding out a way to help my mom,” he continued. Iannuzzi has always worked hard in every aspect of his life to get to where he is right now. He worked hard in school and ended up attending Harvard University and continued to work just as hard on the football field and is now a member of the Grey Cup Champion BC Lions. Sometimes all it takes is for someone to get the right message across to the younger generation and they can transform their lives into something positive. The architecture and environmental science major understands that he is now in the spotlight and has to do for the kids of today, what the athletes of yesterday did for him. “I remember sitting in elementary school like it was yesterday when the CFL guys who just won the Cup would come in with it,” described Marco. “I always knew that it had a special part in my heart so I knew for sure that I wanted to come back and be that mentor or role model for the next generation and I think that being a professional athlete that is one of the most important things, aside from performing on the weekend,” he elucidated. The players and the fans both share a love for the game and for the community in the CFL so playing for the BC Lions and running out of the tunnel every weekend is something that Iannuzzi has wanted his entire life. Sure, it’s not his hometown Calgary Stampeders that he’s representing on a daily basis, but he’s proud to be a member of the Lions and a native of Calgary. He has accomplished another goal in becoming a professional athlete and now has the ability to help raise awareness and can be a voice for the people. He is doing whatever he can to build an image for himself within the Lions community and wants to be the voice of inspiration for the kids of today. “Part of the love for the game is coming out of the tunnel and hearing all the fans cheer for you and you get that electrifying sense that you have the ability to bring that to a room, so as a pro you have to give back to the people who are cheering for you every single week,” stated Iannuzzi. “I check out the schools and talk to people within the community and tell them about my life story and tell them about the obstacles that I’ve overcome and hopefully I inspire them in someway,” he added. “I really think that I’m creating a little bit of a presence in the community and I’m trying to get out to as many events as possible that my schedule will allow me to. There are a lot of things I’ve sort of done up to this point and I want to keep reaching out to the crowd and continue to build an image in the community. When you’re in the CFL you’re not doing it for the millions of dollars, you’re doing it for the love of the game and the support and you’re trying to give back to those who helped foster and build your Foundation,” proceeded Marco. Marco’s Climb for the Cup will take place on Thursday, March 22, 2012. It is an 802-step scramble up the Calgary Tower with the Grey Cup where he will be ready at the top for a photo finish. All funds raised through this event will go towards the Branch Out Neurological Foundation in hopes of getting that much closer to a cure. While he is in town he will also visit his old schools and minor football league programs who helped him become the athlete and human being that he is today. He remembers everything that influenced him when he was younger so now he’s hoping to do the exact same thing for the youth in Calgary to help make them the role models of tomorrow.